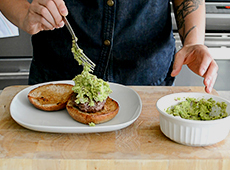 Elevate burger night with these guacamole burgers! 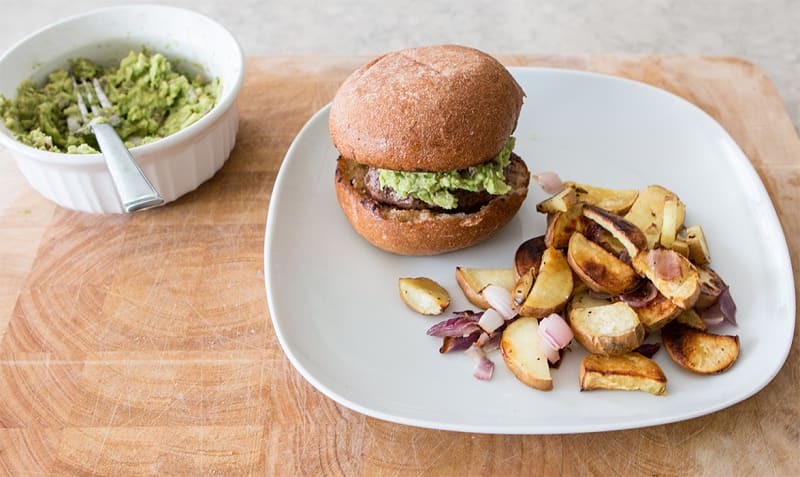 Made with free-range ground beef and organic avocados, and paired with delicious roasted sweet potatoes, this meal is sure to satisfy. Best prepared within two days of delivery. Preheat oven to 450°F. Wash and dry the sweet potatoes. Cut them in half length-wise, and then into ½ cm thick pieces. Peel the onion. Cut off ¼ of the onion and finely dice it. Cut the remaining ¾ of the onion into chunks roughly the size of the sweet potato pieces. Cut the lime in half lengthwise, and cut one half into 4 wedges. 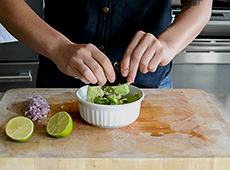 Cut the avocados in half, remove the pits, and squeeze into a bowl. Add the juice of ½ the lime and mash with a fork until smooth. Stir in the finely diced onions, cover, and place in the fridge. 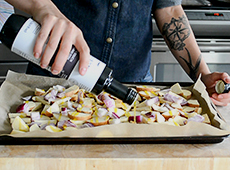 Place the sweet potatoes and onion chunks on a parchment-lined baking sheet. Drizzle with olive oil, salt and pepper to taste, and toss to coat. Arrange in a single layer and roast for 15-17 minutes, stirring once halfway through. When the sweet potato is tender, remove from the oven. While the veggies roast, place the ground beef in a medium bowl and add salt and pepper to taste. Mix thoroughly using your hands, and form the beef into 4 patties of equal size. 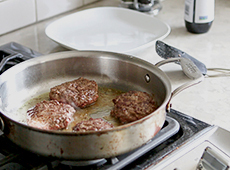 In a large pan, heat a little olive oil over medium-high until hot. Add the patties (in batches if your pan is not large enough) and cook 5-7 minutes per side or until they are browned and done to your liking. Transfer cooked patties to a plate and cover loosely with foil to keep warm. Leave any browned bits and oil in the pan. (Optional) Add the buns to pan, cut side down, to toast and absorb the oil. If the pan is dry, add a little more oil. Toast for 1 to 2 minutes, then move toasted buns to a clean, dry work surface. Place the beef patties on the bottom buns and top with guacamole and the top bun. Place each burger on a plate. Divide the roasted sweet potato and onion among the 4 plates, and serve with a lime wedge.